Frankly, I was so entranced “seeing” that I did not think about the sight. If there was a subconscious thought of it, it was in the nature of gratitude to God for having given the blind seeing minds. As I now recall the view I had from the Empire Tower, I am convinced that, until we have looked into darkness, we cannot know what a divine thing vision is. …What did I “see and hear” from the Empire Tower? As I stood there ‘twixt earth and sky, I saw a romantic structure wrought by human brains and hands that is to the burning eye of the sun a rival luminary. I saw it stand erect and serene in the midst of storm and the tumult of elemental commotion. I heard the hammer of Thor ring when the shaft began to rise upward. I saw the unconquerable steel, the flash of testing flames, the sword-like rivets. I heard the steam drills in pandemonium. I saw countless skilled workers welding together that mighty symmetry. I looked upon the marvel of frail, yet indomitable hands that lifted the tower to its dominating height. Let cynics and supersensitive souls say what they will about American materialism and machine civilization. 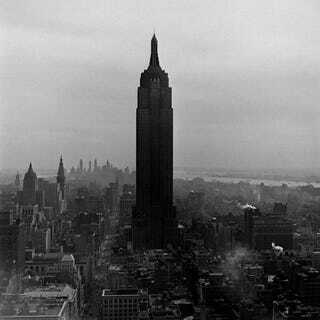 Beneath the surface are poetry, mysticism and inspiration that the Empire Building somehow symbolizes. In that giant shaft I see a groping toward beauty and spiritual vision. I am one of those who see and yet believe.